Elizabeth Stuart by Gerrit van Honthorst. National Portrait Gallery, London. I was doing some reading about the Gunpowder, Treason and Plot thingie when I came across this lady. I read that she was Elizabeth Stuart, daughter of James VI of Scotland and I of England and our very own Anne of Denmark and naturally my interest was spiked. Elizabeth was born on the 19th of August 1596, the second child of James and Anne at Falkland Palace in Fife, Scotland and was six years old when her father took the English throne. She comes into the Gunpowder, Treason and Plot by being Guy Fawkes’ intended Catholic monarch. It was his plan to kidnap her in 1605, when she was nine, and, after assassinating her father to put her on the throne. Happily, Guy Fawkes was apprehended before he could murder her father and Elizabeth remained a princess, not to follow in her aunt’s footsteps as a reigning queen of England. Frederick led the coalition of Protestant princes at Holy Roman Emperor’s court and marrying Elizabeth would have tightened his ties to his fellow protestants at the court. Despite the business-like affair of their marriage, the two were believed to be genuinely in love with each other and Frederick even created an English wing in his palace at Heidelberg to make his wife comfortable. Elizabeth is also sometimes called The Winter Queen, the cause being her husband’s short reign as king of Bohemia. Frederick was offered the Bohemian crown in 1619 and both him and Elizabeth were crowned in November 1619. However, Ferdinand II, the Holy Roman Emperor, had a birthright to the throne and did not let them reign long. He forced the couple into exile by 1920, where Elizabeth came to be known as the Winter Queen. In 1648 her son, Charles I, won back the Electorate of the Palatinate and after the Restoration of the English and Scottish Monarchs, it was also possible for Elizabeth to travel to England to visit her nephew, Charles II. It is also through Elizabeth’s line the Hanoverian royal house of Britain, which ended in 1901 with Queen Victoria, is descended. Her daughter, Sophia of Hanover, had become the nearest Protestant to the English and Irish crown and under the Act of Settlement (1701) the royal crown was bestowed on her and her issue. And this particular blog owner, will never cease to be amazed at how interconnected the royal houses of Europe really are. I hope all of my readers in England are having a great Bonfire Night! Elizabeth as a widow, by Gerard van Honthorst. National Gallery of London. Leonora Christina as imagined by an unknown 19th century artist. Leonora Christina was born on the 8th of July 1621, the daughter of King Christian IV and his noble wife, Kirstine Munk. Kirstine was not the King’s queen, and many doubted that she even was married to him. Kirstine was called The Left Hand’s Wife, the implication being that a queen was married to the right hand. It did not matter that Christian’s wife, Queen Anna Catherine of Brandenburg had died: a prince could not crown a noblewoman queen and Kirstine was the daughter of a countess and a deceased wife. Christian IV is known in Denmark as an entrepeneurial king, and most people realise that it was not only because he built buildings all over Copenhagen, but also because he was quick to make any woman he wanted his. His illegitimate sons born during his marriage were given the surname Goldenlion. But when Anna Catherine died, leaving him two sons, it did not take long for Christian to notice the beautiful Kirstine, and whether his courtiers believed the validity thereof, he orchestrated a marriage – of sorts. Together they had twelve children, two of which were stillborn. Eight were girls, and two boys. 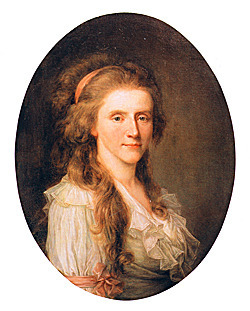 Leonora Christine Christiansdaughter was the third of their children, and together with her siblings she was sent to her grandmother, Kirstine’s mother Ellen Marsvin (literally meaning guinea pig), to be raised until her 6th year. 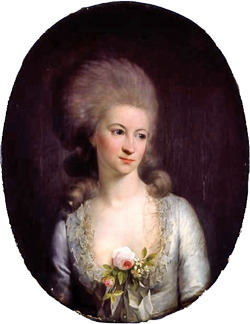 After that she and her sisters were sent to Karen Sehested, one of Kirsten Munk’s ladies, and were raised at Frederiksborg. I became interested in her story around the age of 12, and at that time read a delightful book by Maria Helleberg, a renowned writer of historical fiction here in Denmark. 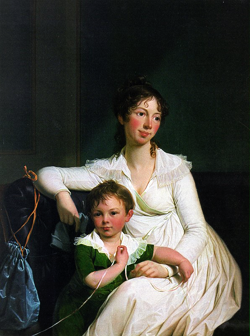 It detailed Leonora Christine’s story from her childhood years until her marriage. The expression the book would always leave me with was that of a girl growing up amongst a plentitude of sisters, fighting for the attention of her elders and the respect of her sisters. It also detailed the sisters’ reactions to their engagements. 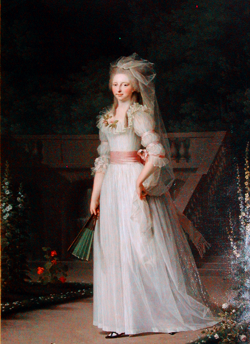 The three eldest, Anna Catherine, Sophie Elisabeth and Leonora Christine were all engaged at more or less the same time, Leonora Christine being 9 years at the time. 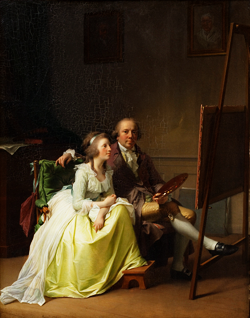 In the immediate years before her wedding, Leonora Christina was moved to the Danish court and proceeded to win the affections for her father. If there is one thing that most people agree on about Christian IV it is that he was a man who loved his children, of whom he had 23, unconditionally, but Leonora Christinia was to win a special place in her father’s heart. Leonora even managed to maneouvre herself into the position of the hostess at the court, since there was trouble between her mother and father, largely due to entirely true accusations of unfaithfulness on Kirsten’s part. Perhaps Leonora needed the victory of becoming her father’s hostess, for even though her father was fond of her husband-to-be, Corfitz Ulfeldt, her sisters were wont to make fun of him because of a stiff leg. Even though Corfitz was only in his twenties, during their engagement, he already had to use a cane, which Leonora’s sisters would point out to her time and again. After his death Corfitz’ was to become known as Denmark’s biggest traitor. Leonora Christina and Corfitz Ulfeldt were married on the 9th of October 1636, Leonora being 15 years old, Corfitz 30. Although the marriage saw its share of adultery, on the part of both spouses, it was reported as a happy one with both partners seeking to overcome their differences and work together. Leonora gave birth to their first child on the 5th of December the next year, a boy they named Christian who would later become a Catholic priest in Rome, although he was born to Protestant parents. Corfitz had been appointed Lord Chancellor (which is really the best translation I can come up with) that same year and he had managed to obtain such power that he could manage to reign for several months after King Christian’s death in 1648. Of course, history is full of examples of why one should seek to not cross kings, perhaps especially one like Frederik III, Leonora’s half-brother, who would later go on to sever the ties that had traditionally held the Danish king accountable to his noblemen and declare himself sovereign king like in the French fashion. Corfitz’, who had grown accustomed to heavy responsibilities, like diplomatic duties that had taken him to Russia, England and so on, was not pleased by his brother-in-law taking into hand the power that was divinely appointed him (as one believed then), and sought to tighten Frederick’s ties during the Royal Election. A Royal Election was the process in which the Danish noblemen worked out a contract which a Danish “Chosen King” (meaning he had been elected by these same noblemen in his childhood to suceed his father) had to sign in order for his noblemen to swear him their allegiance. Frederick reciprocrated by instigating an investigation into Ulfeldt’s financial affairs, and in 1651 the king presented Ulfeldt and his wife with a document accusing Ulfeldt, in his position as Lord Chancellor of having embezzelled the Øresund’s tax, the most profitable of all the king’s incomes. Faced with possibly a death sentence Corfitz Ulfeldt thought it best to take his wife, children and belongings and flee the country. 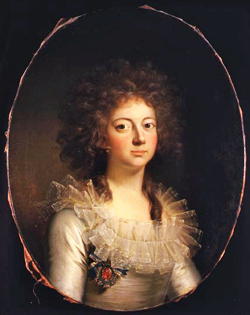 Meanwhile, Leonora Christina had found herself on worse and worse terms with Frederick III’s queen, Sophie Amalie of Braunschweig-Lüneburg, who had found herself quite perplexed, upon her arrival at the Danish court, to find the dead king’s illegitimate daughter inhabitating the position of hostess and head of the court. Leonora Christina, used to being flattered by the Danish court, was not pleased to give up her position and very reluctantly did so. When things turned for the worse for both spouses, Corfitz Ulfeldt and Leonora Christina fled to Sweden, where Ulfeldt promptly entered the service of the Swedish king Karl X Gustav. As a sidenote I might add that Denmark and Sweden have been mortal enemies, but also brother-countries (it’s a strange sort of relationship), since, oh, always. Ulfeldt spent years and years trying to excite anger in the Swedish consciousness. Finally, in 1657, his labours bore fruit and Karl X Gustav marched towards Denmark with Ulfeldt personally joining the army, and happily lent the Swedish army huge sums, that is believed to have stolen from the Danish coffers. Karl X Gustav managed to conquer back the at the time northern Danish, and now southern Swedish Skåne (about which there are still ownership issues to this day), a huge loss to the Danish king and Karl X Gustav made Ulfeldt governor of the area. Soon enough, however, Ulfeldt and Karl X Gustav began bickering and later fighting, resulting in Ulfeldt being taken prisoner, by the Swedish, and placed in house arrest. He managed to escape, with his wife, to Denmark, where they were promptly seized and moved to Bornholm, the easternmost part of Denmark, a tiny, and at the time, isolated place. The castle in which they were moved was a medieval castle. Above is the picture of the ruins I have visited twice now. Leonora Christina and her husband were placed in different rooms, and were forbidden to speak with one another but since they both knew Latin, French and Italian, which their guards did not, they would communicate by shouting out of windows facing one another over a courtyard, one speaking e.g. Italian and the other Latin, and the guards would be none the wiser of whether they were planning an escape or merely exchanging pleasantries. Amanzingly, they were later released from their prison, on the condition that they signed a contract with the king stating that they transferred all their posessions to the king. 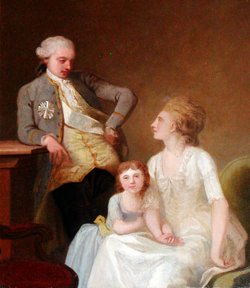 Leonora Christina stayed at home in Denmark, with the children they had not seen for many years, but Ulfeldt decided to travel abroad, more precisely to the home of Frederik Wilhelm, Elector of Brandenburg. Here Ulfeldt revealed, to the horrified elector that he had plans to assasinate the Danish king and that he offered Frederik Wilhelm the Danish crown should he suceed. He did not, of course, and was in fact revealed in his plans by Frederik Wilhelm. This time there was no pardon from the Danish king and Ulfeldt was sentenced to death, in absentia. Ulfeldt fled further away, having been declared the greatest traitor of the country hence. His wife was seized, and their home in inner Copenhagen torn to the ground. In its place the king erected a pillar to the shame of Corfitz Ulfeldt – to the eternal shame and taunting, as it says on the pillar which still stands today. It has been moved to the National Museum, however. So, what happened to Leonora Christina that I would entitle this post The Lady in the Tower? She was, as I mentioned, seized and although she begged for her freedom, being an older lady at this point, she was sentenced to prison and imprisoned she was. In Blåtårn (Blue Tower, a tower adjacent to the Castle of Copenhagen, where her half-brother and his wife lived. She was to stay there for 22 years, surviving Sophie Amalie, who many now believe to have been the one keeping her imprisoned despite Leonora Christina repeatedly refusing that she knew nothing of her husband’s traitorous plans. During her imprisonment Leonora spun and wove cloth, to make clothes from, and she wrote her autobiography, entitled Jammers Minde (Wretchedness’ Memory) which was to be discovered in 1867 causing a veritable scandal. It was one of her daughter’s who went to the king after the death of Sophie Amalie in 1685, and pleaded for her mother to be released. At this time Leonora had been held in Blue Tower for 22 years. Her freedom was granted her and she was moved to live at a monastery for the remaining, and old, nuns of the St. Birgitte-order. She died and was buried at the monastery now known as Maribo Church, but some time later her body was removed, presumably by sons, and re-buried at the undisclosed location where her husband was already buried. 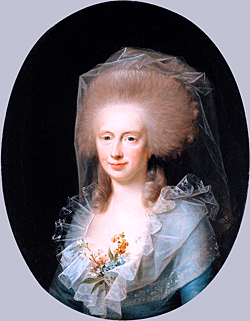 From the day Leonora Christina was married she refused to adopt the name Ulfeldt, and insisted upon being called Mistress Leonora Christina, daughter of the King of Denmark. Yes, I know this blog is called Writing The Renaissance and I promise you that it will actually contain content pertaining to said period. But it just to happens that I spent part of my summer holiday in Berlin, and once in Berlin I couldn’t resist visiting the old 17th century Charlottenburg Schloss, or Castle. Charlottenburg was erected between 1695 and 1699, and originally named Lietzenburg, it was intended as a summer residence for Sophie Charlotte, wife of the Elector Frederick, who in 1701 went on to become King of Prussia, Frederick the First. It was upon Sophie Charlotte’s death that the castle was renamed Charlottenburg. The castle is built in the Italian Baroque style, and seperated into two wings, which are nowadays called the Old Wing and the New Wing. And I will say, that if there was one thing that annoyed me upon visiting, it was that you had to be two admission tickets, one for the Old Wing and one for the New Wing. And they were both 10 euros, and then extra if you wanted permission to photograph. As a result, knowing that I’ll be back in Berlin soon enough, I only visited the Old Wing. I do regret not visiting the New Wing, but being a student I simply couldn’t defend spending 20 euros on admittance to one museum alone. The downstairs of the Old Wing is kept in a very recognisable rococo-style, with everything that entails of gilded ceilings, tapestries and chinoiserie. Being that Charlottenburg is a summer residence it’s not a very big castle, and walking through the wing you’re following a very natural path, taking you through the private and public rooms of the royal family. It’s not incredibly big, and the reason for that is probably that the castle wouldn’t have been used for anything beyond socialising. At any rate, the castle has a very intimate feel about it. As I mentioned the nod to China, the so-called chinoiserie, was ever-present throughout especially the rooms belonging to the female members of the dynasty. Above is a detail from a spinet where you can see Chinese ladies playing in their gardens, presumably at the Imperial Chinese court or something similar. There even was an entire room, walls entirely covered by mirrors for some reason, where what I presume to be original china (I can’t really tell the difference, but as it used to be a royal castle I don’t think my assumption is entirely wrong), was proudly displayed in golden cases in displays like the one above. Yes, even complete with the figurines. Yes, all four walls. I admit that I did quite a double-take upon entering the room, which made a curator look at me like he thought I was rather odd, but I’ve honestly never seen anything like it. Of course, no castle is complete without a chapel, and this is where the Prussians worshipped in the summer. I found it quite beautiful, though there seemed to be quite a lot going on to my Protestant eyes. I’m not averse, by any means, to decoration in churches, I actually find it quite beautiful, but I’m not used to it from visiting Danish churches. On the opposite end to the altar and pew, there is this display and if anyone held any doubts as to whether the monarchs themselves believed in the divine right of the sovereign ruler, I think they can be put to rest quite gently upon seeing this. This is a painting which hung in the first room you entered once upstairs – from the chapel you entered into a sort of grey area, with restrooms, and then out under the (very low, watch your heads!) staircase which was set in a very bright and white passageway in which there also hang some terribly racist paintings that I didn’t get any good shots of. Otherwise, there’d be a whole post on the Western perceptions of the Noble Savage, right there. The painting portrays either a coronation or a wedding, but as there were no plaques on any paintings in the castle (by far, the most annoying thing), I couldn’t say. I think it’s a wedding though. I got really close to it, though, and it had some very lovely details of the crowd gathered. The upstairs of the Old Wing were held in a decidedly different style than the downstairs, post-French Revolution and neo-classicist entirely. Where the downstairs was very colourful, lots of tapestries and such, the upstairs left a much paler and whiter impression, with white walls and so on. I think this is Elisabeth of Bavaria again, and her ladies, dressed up Medieval ladies. Elisabeth’s husband became king in 1840, right when Romanticism in Europe was at its heights, and there was a raging fascination with all things Medieval. They look rather lovely, don’t they? The German eagle, so sadly hijacked by Hitler and his Nazis, but lest we forget, it’s no different from the American bald eagle and nothing makes me happier than seeing Germans use it to express pride in their nation, for example in relation to the World Cup which had just ended (with Germany winning bronze and not gold as they should have, grrr) when I was in Berlin. Young Germans aren’t as afraid as their parents and certainly grandparents were, of using their flag and other national symbols nowadays, which is really a step in the right direction. An Angelic Muse of some sort. This is what his plaque says, anyhow. Homer, Horatius, Shakespeare, Dante, Calderon, Someone I Can’t Make Out, Goethe. When I explained this painting to a friend he casually remarked that it was the equivalent of hanging an Andy Warhol or somesuch, poster on your wall. It says a whole lot about you in the way that it communicates your desire to show how into art or literature you are. Either way, I had a good chuckle over this. The medieval headdress on this one and the complete lack of writing on the bust leads me to believe that this is a woman playing dress-up, or perhaps just an imagination based upon a courtier. The upstairs also included a room where all the paintings where of the Virgin Mary, and one where all the paintings where of Roman locations, such as the a church with nuns praying, the Pope’s chair and a river with sailors sailing by a church in the morning. It had a slightly chaotic but quite lovable feel to it, altogether. This is the view from the gardens, which are now a public park right on the Spree and quite a lovely spot indeed. How’s that for a first proper post?